Did you know that vaccines are dangerous? Or that eating whole lemons (or eggs) prevents cancer? Or that evil doctors kill people to treat them of depression, or that science in general is just bogus studies and money? Those are just some of the headlines you can find on what I believe to be one of the biggest sources of misinformation on the internet and quite possibly the most popular pseudoscience hub: Natural News. We encounter pseudoscience every day, and we generally just ignore it and shake our heads; at most, we’ll explain why they are wrong and highlight what the science actually says. 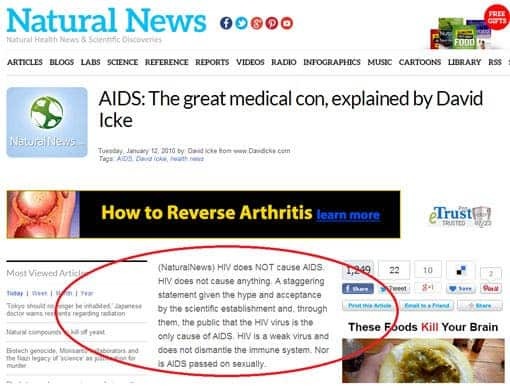 Why then, are we paying so much attention to Natural News? Ironically, the reason lies in the numbers: they do have millions of readers every month, and they user base is growing – they managed to get a huge traction especially on Facebook, and that’s troubling. They’re spreading wrong information, manipulating their readers, and they’re good at it – they’re especially good, as Slate puts it, at moving unsophisticated readers from harmless dietary balderdash to medical quackery to anti-government zealotry. Also, they’re trying to convince people to reject science and medicine, as well as attempting to convince them to accept completely unsubstantiated and unreasonable conspiracy theories. But it goes even further – they’re spreading hate against actual scientists and the people who actually promote science. Recently, Natural News published a post indirectly calling for the killing of scientists, publishers and journalists who covered GMOs. Astrology, the simplest way you can determine if someone is scientifically literate – the belief that groups of stars that look somewhat like… things define your personality and your future! Natural News once claimed that a paper in Nature Neuroscience provided evidence for astrology. Spoiler alert: that’s not what the paper claimed – it actually had nothing to do with planets or stars, as you’d expect from a paper published in Nature Neuroscience. Sure, some things are healthier than others, and eating some foods encourages cancer, but whenever you read “eating [this food] prevents cancer”, your BS radar should go through the roof. “The study, published in the journal Nutrition and Cancer in 2000, purported to show a correlation between consumption of lemon peel and diminished cancer risk. The authors surveyed 242 skin cancer survivors and 228 controls about their citrus consumption habits, but the questionnaire wasn’t externally validated and has some screwy definitions. (Eating citrus peel “often,” for example, is defined as “50-75 percent of the time.” What does that mean? ),” Slate writes. But Natural News is full of these “jewels” – it’s not only lemons that prevent cancer, but also organic green shakes, cilantro, blueberries, and spirulina. In case you’re wondering why only they are covering these topics, it’s not because they’re blatantly wrong, it’s because the organic green shakes, cilantro, blueberries, and spirulina – yes, I’m sarcastic. This one is actually a bit more complicated. In case you’ve missed all the fuss about vaccines and autism (congrats if you did), a 1998 paper in the influential medical journal The Lancet claimed that the vaccine for measles, mumps, and rubella caused autism. After countless preventable measles outbreaks and a lot of debate, we now know for sure that theclaim is wrong. Literally hundreds of thousands of children have participated in studies around the world showing no association between vaccines and autism. Furthermore, The Lancet has withdrawn that paper and the author has lost his medical license. Where do I even start? There are natural, simple cures for cancer, but the FDA “buries” them. Marijuana cures cancer. Ginger cures prostate cancer. Vitamin C cures pneumonia. Strawberries cure gastritis and carrots, of course, cure cancer. Don’t let this deter you from eating healthy foods – strawberries, ginger and carrots can be healthy for you and can have positive impacts on your health, but claiming that they cure cancer or pneumonia is simply nothing but quackery. I could go on for ages; most of their articles are flawed, instigating, or down right wrong. The fact that such a non-scientific website has such a large following and somehow manages to convince people that they’re presenting real facts is sad, and shouldn’t happen. If you’re interested in actual science and not delusional quackery, you’d do well to stay away from Natural News.